Thank you for visiting my sketchblog! My name is Pete, I live in Davis (California), and I am an urban sketcher and avid keeper of sketchbooks. I am originally from Burnt Oak in north London, but moved to California because the fire hydrants here are easier to find. I sketch the world as I see it, I like to write a few things, go to a few places, and keep myself busy. I like to encourage the act of location drawing / urban sketching, and since 2010 I have organized a monthly (well, nearly monthly) sketchcrawl called “Let’s Draw Davis”. as a way to bring local sketchers together to draw their city. Here’s an article about it in the California Aggie, and another mention in UC Davis Dateline. This led to me organizing several more sketchcrawls in London, from the first one (called “Let’s Draw London”, which was the first official sketchcrawl of Urban Sketchers London) to the ‘themed’ sketchcrawls such as “Sketching Jack’s London“, in the Whitechapel of Jack the Ripper (2013), and “Sketching Wren’s City“, a sketch-hunt of all of Christopher Wren’s Buildings in the City of London (2014). Since 2008 I have been the Davis correspondent for the global sketching website Urban Sketchers. I was in the founding group of correspondents. Since then Urban Sketchers has grown to have thousands of members and hundreds of chapters worldwide. 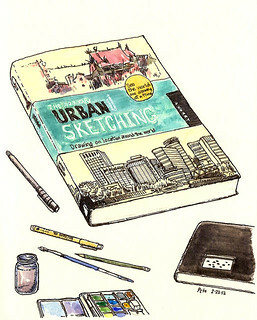 My sketches of Davis were featured in the book ‘The Art of Urban Sketching’, by Urban Sketchers founder Gabi Campanario. I gave a talk about the book and about urban sketching at the Avid Reader bookstore in February 2012 (Davis Enterprise mention). 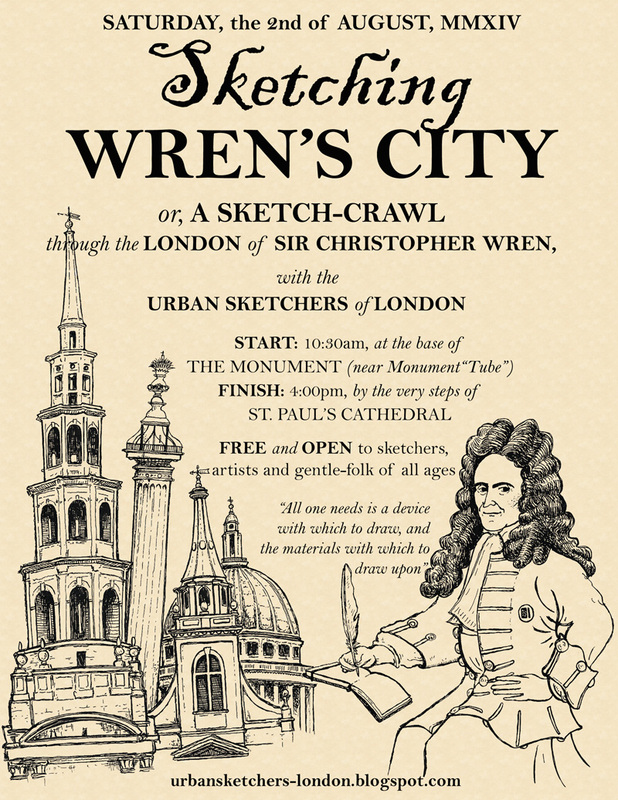 Since 2012, I am a guest correspondent on Urban Sketchers London, and has organized four themed sketchcrawls in London, the most recent being “Sketching Wren’s London” in July 2016. I have also taught workshops for Urban Sketchers SF Bay area (San Francisco, June 2017) and Urban Sketchers Portland (November 2018). In December 2011 I had a successful solo exhibition at the Pence Gallery in Davis. 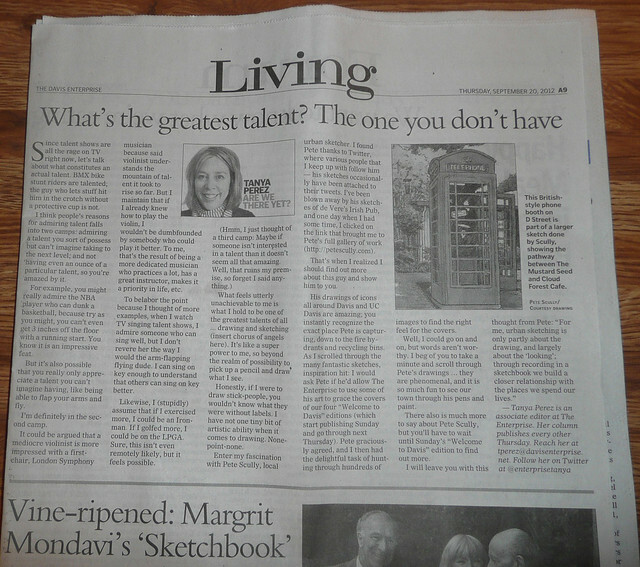 Here’s an article in the Davis Enterprise: “See Davis Through Scully’s Drawings“. I have participated in several other joint exhibits at the Pence Gallery since, such as 2018’s Halloween show. I have also exhibited at Armadillo Music (Jan 2011), the Avid Reader (Nov 2011), and First Street Real Estate (Nov 2014) for the Davis 2nd Friday Art About, also at the Davis Public Library (Nov 2011), and was included on the 2013 Downtown Davis calendar (for March). I also exhibited as part of the “Scene In Davis” show at the Art Is Davis Co-Op in June 2014 with several prominent Davis artists. In the Fall of 2016, I had a special exhibition of my sketchbooks at the UC Davis Design Museum, which included a talk on keeping sketchbooks in early October 2016. The exhibit was called “Conversations with the City” and featured 30 sketchbooks from 2006-2016. Here is a piece about the exhibition on the UC Davis Arts page, and an article about it in the Davis Enterprise. 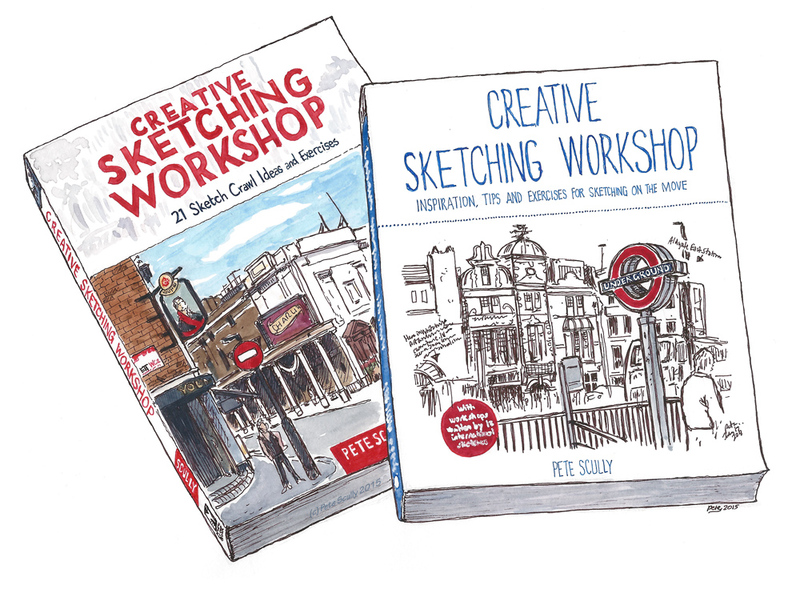 In October 2015, my first book “Creative Sketching Workshop” was published by North Light Books and Apple Press. This book features the creative talents of twelve sketchers from around the world who contributed chapters (workshops) on various subjects related to urban sketching. You can order a copy from Amazon, or from North Light Books, or check your local store. My second book, “Five Minute Sketching People” was published in October 2017 by Firefly in the US and Apple Press in the UK. You can find it on Amazon, or your local store. They even have it in Tate Modern! 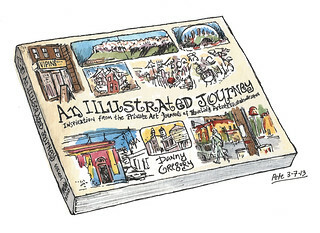 In February 2013, I was one of the artists featured in Danny Gregory’s book “An Illustrated Journey“, a collection of forty traveling sketchbook artists from around the world, talking about their lives and journeys as artists. One of my sketches (of Vipin’s in my native Burnt Oak) was placed on the cover. Find out more about the book on Danny Gregory’s website. Other published work includes a book called “London Walks, London Stories“, a guide book of sorts written by David Tucker and various other Blue Badge guides of London, for which Pete provided the illustrations. I also drew two short comics for the popular band Art Brut when they released their ‘Best Of’ album “Top of the Pops” in 2013; selected artists drew short comics based on different songs on the album, and were released as part of the app that accompanied the album (which used to be in the App Store, but not any more…). In September 2012, the Davis Enterprise featured four of my Davis drawings on each of its four Welcome To Davis editions. You can read about those here and here. I live up near Placerville (Diamond Springs), and was unable to make the last sketchcrawl. Will you be organized the next one?? I’d definitely like to join. hello; probably not, if i do the next sketchcrawl i might go to the bay area, I did Sac last time because i love drawing in midtown! Or I’ll do a davis one. Hey, cool, Davisites unite! Davis must be a big change! I’ve been in California for a while now, but used to live in the high mountains of Colorado. It gets a little too hot for me here in the summer, but otherwise, I love being able to ride a bike 12 months a year. I really like your sketches. Thanks for finding my blog! Steve Barnett here. I’d left a note on SketchCrawl regarding my interest in possibly using drawings for a London Guide Book. I’d like to contact you, can you please let me have an address to email to. I have sent you an email. Thanks for stopping by! street pete & I wonder if you got my message about Sulloniacis, the orange watling, the whole resonance….? Who is in whose footsteps? My son is an Aix conception, but a bit older. I was thrown out of my first holiday job in an arcane grocery, near the top of the Broadway, after I read a beat poem from Evergreen Review that included the **** word. We used to hang out in the bowling alley. Watling lads’ parents had kitchen cupboards full of amphetamines rather than food./ Cut to forward…. I’m a fan. The skill of the craft and observation are there but it’s the humanity, a visceral perception that let’s a child’s feeling view, penetrate the world. It’s saying ‘You see a drab world? It’s the way you’re looking’. You have the character eyes to do it and the philosophy of the poets pencil. The not-you lets the essence come through. So I want to ask if you would be willing to license to print from screen? I assume that you sell the originals? Best regards to the whole fam – your son looks pretty robust. PS Your words on Boris are the same as mine. But now he’s mayor, buffoonery’s suppressed. About a week before, I saw Ken, as usual in Waitrose, Finch Rd. He had a big collar turned right up and was checking out. It’s like going from Legoland to the Casino! I’ll send you an email. Cheers! I’m at UC Davis these days and I’m a DJ at KDVS and I was thinking you should submit something to KDViations the station’s quarterly magazine. Let me know if you’re interested and I can give you some more details. Hows it going Matey? been meaning to drop you a line for ages but doin me HGV at mo so times been limited. Just finished doing a course on NLP with Andrews company which i really enjoyed and highly reccomend the subject. Will be in touch A.S.A.P. but you know me could be any time. Hope Angela & little Luke are both well, loved the pictures you sent. Your sketches brought back many memories. I went to the Anuncation School then onto Saint James Secondary student during the 40’s, I took the tube from Edgware to Burnt Oak daily, Watling Ave, was a treasure trove of shops in those days. Like you I am now living in CA. I too used to live in Crouch End (near the clock tower) and went to school at St James in Burnt Oak. A daily 41 bus ride to Archway, tube to Camden Town then a walk up Orange Hill Road. You make it look better than I remember it! Hi Pete…All of your sketches are beautiful! You did some of Sacramento, one of them was of Bishop Gallegos. He is actually my uncle, my fathers twin brother. The sketch yo udid of him is wonderful and its special feeling to know that in such a big busy town with so many things to choose to make sketches of that there was something about him (his satue) that caught your eye enough to take the time to do a sketch of him….thank you! p.s. I have enjoyed your writings as much as your sketches, you are very talented! Thank you! How cool! I really do love that statue of Bishop Gallegos, he has a big smile on his face. I met you the other night at our mutual neighbor’s house for dinner – just got a chance to check out your blog – very cool stuff! There are a number of students at the school that I teach at (www.metsacramento.org) that are pretty enthusiastic (and in some cases talented) illustrators themselves – let me know if you might be up for one of them contacting you for some ideas/tips about how to continue to pursue it and develop additional skills. hi pete, i grew up in Burnt Oak with you and just come across your work by accident while looking up stuff for no reason what so ever. I remember being at your house when i was younger and staying over at some point and going out to buy sweets and mr men magazines with your dad.Remember playing in your back garden to on a climbing frame if my memory serves me right.Yes i rember the funny way you held your pen but also the amazing drawings you done as a child.Hope you dont mind me saying hi, your pictures of Burnt oak are so spot on its scary.I still have to see the place every day when i take my kids to school,three of whom now go to Goldbeaters (two others are at senior school and one to young for school).Nice to see your talent never went to waste.Take care. I wondered if you wanted to participate in a new book I’m doing. Could you email me if you do and I’ll send you details? Hi, Pete. All of your sketches are very beautiful! I really love them. Hi Pete…stumbled here randomly because I am designing website graphics for a friend using the same template. I am from California…living in London…and I love your drawings of both places. I am glad I found this. Will keep it bookmarked when I feel the need to be inspired in my drawing (too much illustrator and photoshop theses days). Cheers! I will eat a Dairymilk for you if you have a decent taco for me! Thanks for the message Sally! I’m organizing a sketchcrawl in Whitechapel next month if you’re interested in doing some London sketching, I’ll post details soon. This is the great blog! Your drawings seem like my memeto’s child that brought back me to draw and draw when I was 10. My name is Neal Gutierrez and I am part of the Outreach and Publicity Committee for the Davis Newman Catholic Center. I was searching throughout the web and came across your beautiful sketches of the Newman Center at Davis and the St. James Catholic Church. I would like to ask permission to use this pictures on our website (davisnewman.org) and on flyers to encourage others to come to our 9PM Sunday Student Mass. In no way will these sketches be used to gain a profit and we would definitely provide credit descriptions to credit your amazing work. Please let me know if this is possible and the appropriate way to credit your work. I look forward to your response. So glad to have stumbled upon your blog, your drawings are beautiful! Hello Pete, My name is Brendan and I currently live in the apartments above the Fast and Easy Mart in Davis, CA. We noticed your amazing sketch of the building and would love to use it. The tenants of the 6 apartments above the mart and I wanted to create shirts to make our time living about the mart memorable. We are not selling them, just giving it to the people that live here. We tried to order the shirts on Custom Ink, but they require written permission from the artist. We love your drawing and want to put in on the back of the shirts, and will keep your name with it. We would love to give you as well. Let me know what you think.